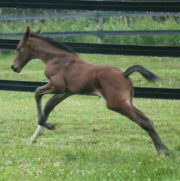 Another lively, happy, exuberant, leggy foal from Contessa — ZuperZonic by Glock’s Zonik. He makes me smile every day with his friendly, engaged joyous attitude. He will be a great partner for someone, with the athleticism to excel in dressage and the character to make the journey a pleasure. 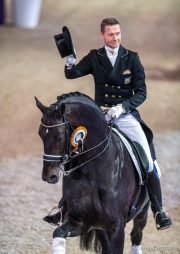 Zonik is now at the top of his game, with many Grand Prix wins to his credit – most recently winning the Grand Prix and Kur (with 80.6%) at Rotterdam in June 2018. He seems to possess it all: beauty, style and power in all three gaits. 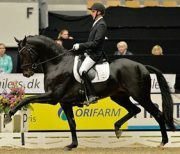 And his pedigree is loaded with Grand Prix Dressage masters: Zack (by Rousseau) on the top, is competing successfully at that level, representing Denmark this year at the World Games. On the bottom we find Romanov (by Rohdiamont) who has represented Germany and Holland at the Grand Prix level, and the phenomenal Grand Prix star, Don Schufro. ZuperZonic’s dam Contessa was bred by me in Germany and imported in-utero. She is the light of my life – confident, independent, gentle, with joyous, extravagant movement. 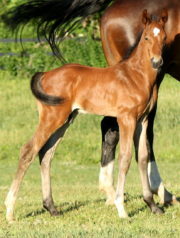 All her foals have been outstanding. Any who went to Inspection earned a “Champion” title. They have gone to excellent competition and amateur homes, competing up to Prix St Georges, to date. I have high expectations for this lad – he will excel in the dressage ring, and be a most rewarding partner, with his sunny disposition and engagement. 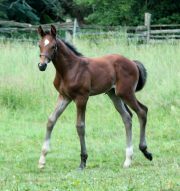 SOLD to a dressage home in PA.
Video shows ZZ at turnout, 3, 4, and 10 days, and almost 2 months old. 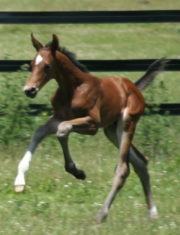 Pictures are from birth to about 6 weeks old, followed by photos of his illustrious sire. 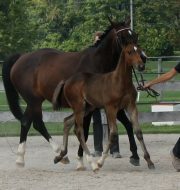 UPDATE: Our Hanoverian Inspection was yesterday, and ZZ did very well – earning high praise and a Gold Medal Foal Award. Professional photos coming soon. Video below of his presentation and judges’ comments.